Finally I was given the ok by the Ortho to go back to whatever I was doing before the crash. I started my upper body weight program again today and I'm going to need a lot of time to bring the arm and shoulder back to where it was. I did 10 push ups yesterday and I couldn't go all the way down and the arm bothered me during the day. It's going to take time but I'm doing it right. As soon as the trails are dry I'm going to ride off road and see how it feels. I've been riding the road bike and using every hand position without much discomfort. I need to start increasing my mileage again since I've only been riding my 35 mile loop around Valley City, now I can start riding to work again which will give me 64-70 miles roud trip. Hopefully no more accidents this summer. Come to think off, I've had some kind of accident or illness the last two summers. Last year it was the elbow doing ORAMM in NC. The year before it was anemia and walking pneumonia. 3 in a row, looking forward to an accident free summer. 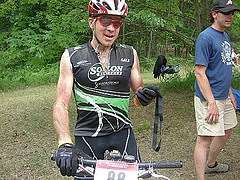 2006 Endurance Racing – 1st place WV wild 100K, 5th Wilderness 101, 5th place LumberJack 100. 2006 XC – 4th place Expert Vultures Knob, 4th place Expert Fox Creek. 2005 Cyclocross -- 4th place overall in “A” class cyclocross series (http://www.teamlakeeffect/). 2005 XC – 1st place Expert Vultures Knob, 1st place Expert Fall Fest (NY), 2nd place Expert West Brach, 3rd place Expert Lake Hope, Clearfork, and Snowtrails. 2002 – 2006 Active CAMBA (Cleveland Area Mountain Bike Authority) member, building trails. Personal & Professional Life:Married to my high school sweetie Tiffany. We reside in the Boro (Streetboro) with our two little girls, Emily (2.5 yrs) and Hannah (8 months). I started bike riding like any other 4 year old kid…getting pushed down a grassy hill only to fall down and try again and again, until the moment everything worked. When I was in the 5 grade, freestyle biking was the only thing I was interested in, I read every issue of Freestyle magazine and BMX Plus and knew the price list for all components like the back of my hand. It took me ~ 8months to save enough money for my first freestyle bike, but it was worth it. Within a year all my friends were freestyling and we would travel to Cleveland and Columbus, Ohio for competition…Man those were the times, biking all day long, hitting the short ramp working on the newest trick you just read about in the magazine…Well a long time has passed since then, and I can say that I still love bikes. 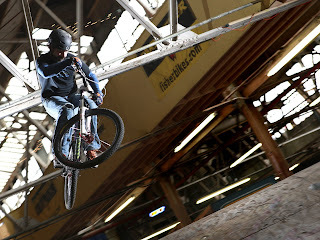 I started racing XC mountain bikes competitively in 2001. And, in 2003, I won the overall XC Sport title at Mt Snow and at Snowshoe NORBA events. For 2004 I made the jump to the expert class, and been very competitive, winning the NORBA Ohio State Championship and placing 3rd Expert overall in the Ohio Mountain Biking Challenge Series (OMBC). In the late fall of 2004 I started racing the local cyclocross series (http://www.teamlakeeffect.com/) on my Jamis XC Dakota and competing very well with the guys on true cyclocross bikes. This year I upgraded to the Jamis Super Nova and raced the “A” class, nothing like slicing through the mud and eases jumping obstacles like an 18# racing machine. In 2006 with the announcement on the “National Endurance Series” AKA 100 mile XC race series, I decided to change my training focus from 2- hour XC races to the 8+ hour body aching marathons. I was able to place 5th at the LumberJack 100 (Michigan), 5th at the Wilderness 101 (PA), and win the Wild 100K in West Virginia. In the off season I enjoys downhill skiing, running, wine tasting, and brew making. From 9 to 5 you’ll find me building child safety seats at Graco Children's Products, working as a manufacturing engineer. And from 5 to 8PM you’ll find me and my wife chasing around our 2 year old daughter Emily and caring for my little, but plump 6 wk old daughter Hannah….Can’t wait till summer to pull both in the Burley. Try to actually have races with no mechanicals, Something seems to happen every race. One of the main leaders in Building and maintaining the Reagan Park trail system. Help with putting on Races at the Knob and Reagan Time Trial. The team was founded in 2006 although the many of the members have been riding and racing together for years. The team had many highlights in 2005/2006 including Kevin Daum getting the Golden Buckle at Leadville 100, Ross Clark scoring a podium 5th place finish at Wilderness 101, Bob Rodgers recording a top 20 finish at Lumberjack 100, Steve Twining with numerous podiums in the OMBC XC Series, Tiffany Clark having two babies and still competing in the local cyclocross series, Jeff Augustine with numerous outstanding age group and overall finishes in local and regional triathalons. The team is expecting big things in 2007 with some new sponsors and new team members. On addition to our race schedule, many of us are involved in various charities and non-profit groups. We also help out with CAMBA and local trail building.